The International Lutheran Council is a worldwide association of confessional Lutheran denominations. It is to be distinguished from the Lutheran World Federation and the Confessional Evangelical Lutheran Conference. The member church bodies of the ILC are not required to be in church-fellowship with one another, though many of them are. The organization was constituted in 1993 at a council held in Antigua, Guatemala, although it traces its roots back to theological conferences held in many locations during the 1950s and 1960s. Member bodies of the ILC hold "an unconditional commitment to the Holy Scriptures as the inspired and infallible Word of God and to the Lutheran Confessions contained in the Book of Concord as the true and faithful exposition of the Word of God." The Council has thirty participating churches as of 2007. Among its larger members are the Lutheran Church—Missouri Synod (LCMS), the Evangelical Lutheran Church of Brazil, and the Lutheran Church—Canada. Altogether, approximately 3,450,000 adherents belong to ILC member churches. The Council's Chairman is Bishop Hans-Jörg Voigt of the Independent Evangelical Lutheran Church, Germany. The Executive Secretary is the Rev. Dr. Albert B. Collver III, Lutheran Church-Missouri Synod. 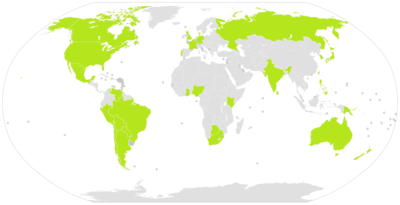 Delegates to the ILC meet every two years. The organization has not accepted the Joint Declaration on the Doctrine of Justification, an agreement reached by the Catholic Church's Pontifical Council for Promoting Christian Unity and the Lutheran World Federation, in 1999. The origins of the ILC go back to a meeting at Uelzen, Germany in July 1952 by Lutherans who were not happy with the theological course being taken by the Lutheran World Federation (LWF). Among the participants were delegates from the Lutheran Church–Missouri Synod who had been observers at the LWP assembly in Hannover. Other delegates were present from churches affiliated with the LCMS from Germany, Australia, Denmark and the United Kingdom. Two further meetings were held, in Oakland, California in 1958 and in Cambridge in August 1963. At the latter meeting it was decided to create a permanent organization, a "Continuation Committee", to act for the group in between meetings, which were now dubbed International Lutheran Theological Conferences. The committee was also tasked with publishing a theological journal and a committee bulletin, and with facilitating exchanges of pastors, theological professors, and students. However, the meeting explicitly disclaimed it was founding a group in opposition to the LWF. Five more "theological conferences" were held until the name was shortened to International Lutheran Conference at the Eighth conference in Porto Alegre, Brazil. Resolutions passed during this period described the ILC as a partnership, forum, or "group of independent Lutheran churches". At the Fifteenth Conference in Antigua, Guatemala the group decided on creating a more formal structure as an association of churches and adopted a document Guiding Principles which would serve as a constitution and theological point of reference. The "Continuation Committee" was replaced by an "Executive Council". Evangelical Lutheran Church - Peru (Iglesia Evangélica Luterana - Perú) (Note: this is not the same Lutheran denomination like Iglesia Evangélica Luterana en el Perú, known as Christuskirche, member of the Lutheran World Federation).